Don't even think about telling these ladies to cover up while feeding their babies. There's one struggle almost all mothers can relate to: The difficulties associated with breastfeeding—especially when you need to do it in public which is, unfortunately, still frowned upon by so many people. That's probably why Vanessa Simmons of Candid Perspective Photography ran into a bit of a problem when she uploaded a photo of a breastfeeding mom—shortly after she shared the photo, Simmons saw an outpouring of hate and criticism on her feed. The experience led Simmons to found the Normalize Breastfeeding project. She shares photos of a diverse range of women nursing their babies to challenge societal opinions of women who breastfeed in public. Among these diverse women? 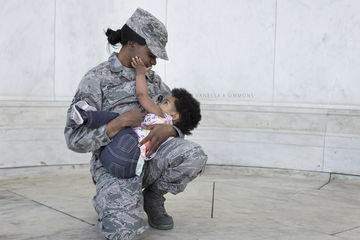 The ones who serve our country. 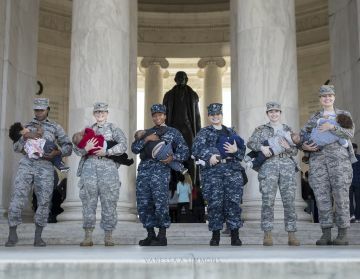 Simmons recently shot a group of uniformed women from the Army, Navy and Air Force to make a powerful statement. 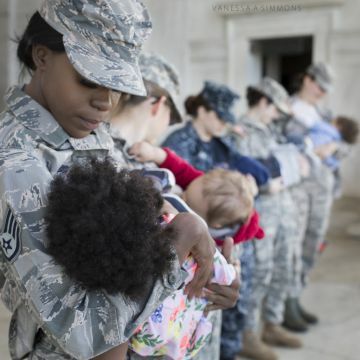 "I hope that others recognize the difficulty at hand for every mother to breastfeed their baby, yet I also hope that they see the strength of the women who serve our country while serving their families simultaneously," Simmons told PopSugar. "I'm inspired by their stories, I'm impressed by their bravery in the midst of mothering, and I'm grateful to have the opportunity to share the images that I captured." The photographer is committed to capturing all sorts of mothers. "Whether that is diversity in ethnic backgrounds or breast milk delivery—nursing, pumping, and donated breast milk—this is their 'variation of normal,'" she said. 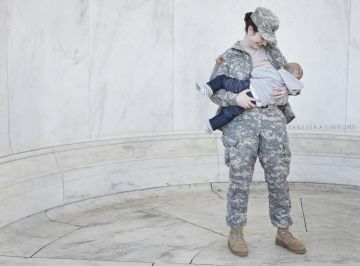 To that end, images of the women who must breastfeed in their official uniforms deliver a strong message. Serving your country takes courage. Being a mother takes courage. Combining these two things is the norm for so many moms out there—and that's a remarkable thing.